Loraen, this is for you! I finally got it finished. I hope it matches your room! 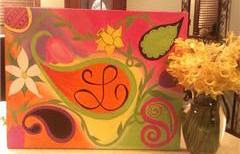 Loraen Ehrhardt asked me to make a paisley canvas for her room. She said her colors were hot pink, lime green, orange and black. This is what I came up with. It was actually alot of fun to do! Nice work I did nto know if you had my blog address but add me as a friend if you would like.